Portland State University’s Resource Center for Students with Children wanted an illustration that would be displayed as a large decal on the front windows of their new building. I worked closely with the center’s staff to create a design that would represent the children who visit the facility. 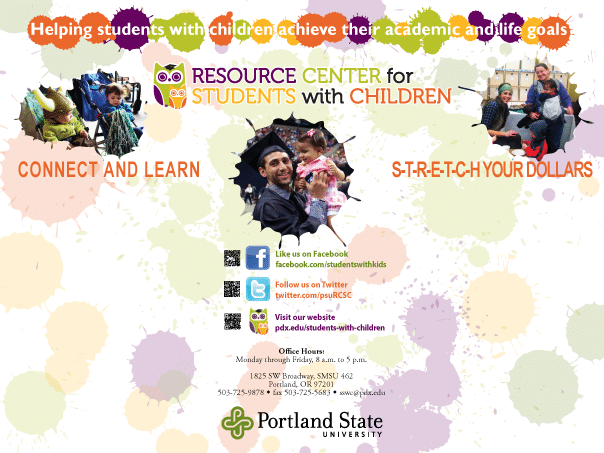 Portland State University’s Resource Center for Students with Children requested an eight-foot-wide banner advertising their services to students with families. Their vision included a tree with keywords, so I turned those words into unique leaf shapes and designed the tree so it would balance out the “weight” of the left side of the banner. The Resource Center for Students with Children needed a tabletop display that continued the playful look and feel of the other marketing materials, but it required open spaces for the most up-to-date content to be attached. The Resource Center for Students with Children asked me to create a fun and engaging full color, full bleed brochure to replace a black-and-white version. I worked with them to incorporate the university’s branding and color scheme but with a twist that would make this brochure less “corporate” looking. This piece defined the look of the center’s follow-up marketing materials, including a large banner and a tabletop display. Portland State University offers lactation rooms for breastfeeding moms throughout its campus, so I created this full-color brochure with an easy-to-read map displaying the lactation room locations. The map was originally created by another designer at the university, but I incorporated usability features and simplified the design to make it easier to follow. A real student and her newborn are featured on the front.